It was a very tough call to make to a friend, but Tony Parker had to do it. With his once powerhouse ASVEL in the basement of the top French basketball league, Parker told head coach Pierre Vincent that it was best that he was relieved of his duties immediately in November 2014. Starting at point guard for the San Antonio Spurs is just one of Parker’s basketball jobs. The majority owner and president of the ASVEL basketball club in France who once had to fire a coach talks to the general manager daily, makes roster decisions, sends encouraging text messages to players and more. And while NBA point guards typically make good head coaches, he would rather be an NBA GM once he unlaces his sneakers for good. If Parker gets his wish, the soon-to-be 34-year-old — raised in France but grew to love basketball during summer trips to his father’s hometown of Chicago — will retire from the Spurs with 20 years of NBA playing experience at age 38 and head into management. Upon retirement he will already have acquired an impressive resume to aid his NBA GM dream thanks to his stellar playing days and ASHVEL ownership. Hopefully, the four-time NBA champion’s GM outlook come retirement time will be much better than the current bleak outlook for blacks and black former players who dream of being NBA GMs and coaches. The NBA was composed of 74.4 percent black players in 2015, according to a study from racial equality activist Richard Lapchick. As for NBA presidents of basketball operations and general managers, the representation for African-Americans is quite the opposite for the 30 teams. The NBA has one African-American president in the Los Angeles Clippers’ Doc Rivers, two African-American GMs in the New Orleans Pelicans’ Dell Demps and the New York Knicks’ Steve Mills, and one native African GM in the Toronto Raptors’ Masai Ujiri, who is Nigerian. Upon hearing the lackluster front-office statistics for blacks, Parker refused to let that dissuade him from his NBA GM dream. For today’s black assistant NBA GMs and former NBA executives, however, it is difficult to stay positive about a possible big break. The last three NBA teams that have made GM and president hires have done so without hiring any minorities. The Brooklyn Nets didn’t interview one minority candidate before hiring New Zealand native Sean Marks from the Spurs as their new GM, having only served three years as an assistant coach. Philadelphia 76ers president Jerry Colangelo hired his son, Bryan Colangelo, a formerly of the Phoenix Suns and Toronto Raptors, to be its new GM. The Minnesota Timberwolves also hired Tom Thibodeau as president and coach and Scott Layden as general manager. All are white men. The Wolves recently relieved GM Milt Newton, an African-American, of his duties. Since 2010, 30 NBA positions for president of basketball operations or general manager have been filled with six African-Americans hired, according to Comcast Sports Chicago. “If 75 percent of the NHL’s general managers were black, I’m sure it would be a big issue,” one NBA assistant GM who declined to go on record told The Undefeated. The NBA does not have a mandate similar to the NFL’s Rooney Rule established in 2003, which requires teams to interview ethnic minority candidates for senior operations positions. NBA chief diversity and inclusion officer Oris Stuart met with NBA owners at the board of governors meeting recently. Former Charlotte Bobcats general manager and president Rod Higgins, an African-American, believes it would be a good idea for the NBA to adopt a Rooney Rule. “There are more than enough qualified minorities to fill these jobs. You can look at the statistics, you can look at the hiring process, you can look at a number of different things,” Higgins told The Undefeated. Michele Roberts, executive director of the National Basketball Players Association, is interested in discussing the possibility of the NBA adding its own version of the Rooney Rule to facilitate more diverse hiring in the executive and coaching ranks. “I don’t know, and I don’t want to pretend to know, if anything, what the league is doing. I don’t know if we necessarily need to replicate football with the mandatory interviews of GMs and coaches of color. It couldn’t hurt. But we have to do something,” Roberts told The Undefeated. Higgins has 14 years of front-office experience that also included stops with the Washington Wizards and Golden State Warriors. The former NBA player was general manager of the Bobcats from 2007-11 and president from 2011-14. Those teams had a combined record of 256-313 under his stewardship. The Warriors made the postseason once, advancing to the second round of the 2007 playoffs after upsetting the 67-win Dallas Mavericks in the first round. The Bobcats were swept out of the first round of the 2010 playoffs. After stepping down as president of the Bobcats on June 13, 2014, Higgins has not been contacted for another president and GM position. The former NBA player did recently interview for the Milwaukee Bucks’ assistant general manager opening. “The competitive nature of the business of basketball is what drives people like me,” Higgins said. “If the opportunity presented itself for a good competitive environment on a competitive team, of course I’d be interested. I have not been contacted for a [GM] job. While Billy King had stops as GM of the Philadelphia 76ers and the Nets before resigning from his position with the latter this year, most black GMs have not received a second chance. 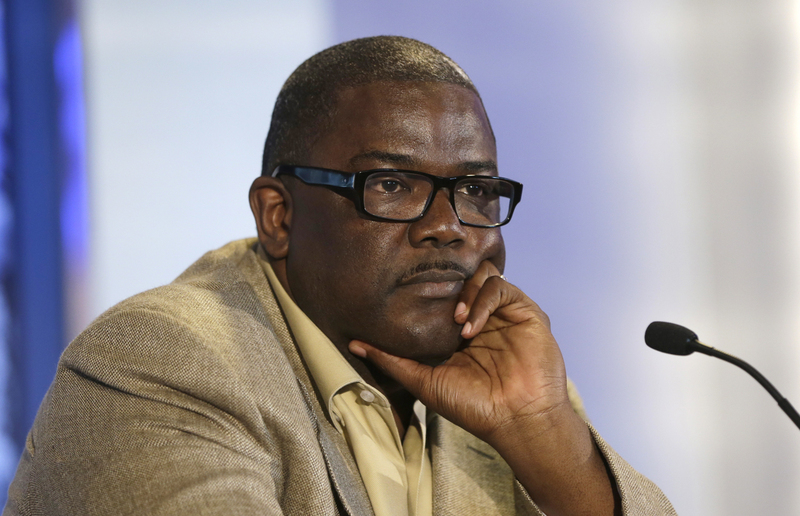 Detroit Pistons President of Basketball Operations Joe Dumars is seen during a news conference at The Palace of Auburn Hills, Mich., Tuesday, July 16, 2013. Under Joe Dumars from 2000-14, the Detroit Pistons won a 2004 NBA championship, made two NBA Finals appearances and advanced to six straight Eastern Conference Finals appearances. The Hall of Famer has yet to return to a management position, but a source close to him told The Undefeated that he is still hopeful for the right situation. Former Memphis/Vancouver Grizzlies and Atlanta Hawks general manager Billy Knight, who drafted Al Horford, traded for a young Joe Johnson and got the Hawks back to the postseason, has not resurfaced since resigning in 2007. Former Knicks interim president and GM and Bobcats executive vice-president and chief operating officer Ed Tapscott is now the Wizards’ vice president of player programs. Former Orlando Magic general manager Otis Smith is now the D-League Grand Rapids’ GM. Newton is also now available. “It is ridiculous that Joe is not working in the league right now,” one NBA GM said. What about the emerging candidates? It’s been established that there’s no paucity of blacks capable of managing organizations. Who are they? Numerous NBA executives say that the two most highly regarded black candidates are Oklahoma City Thunder vice president and assistant GM Troy Weaver and Orlando Magic vice president and assistant GM Scott Perry. Knicks director of player personnel Mark Hughes and Utah Jazz vice-president of basketball operations Walt Perrin are also highly regarded. Sixers vice president of player personnel Marc Eversley, an African-Canadian who is expected to become a U.S. citizen soon, is also well-regarded candidate. Weaver was an NBA scout for the Utah Jazz from 2004-07 before being promoted to director of player personnel. He joined the Thunder as an assistant general manager in 2008 and was promoted to vice president in 2010. He’s interviewed for GM jobs with the Orlando Magic and Portland Trail Blazers, taking his name out of the running for the Jazz job after the Thunder upgraded his pay to the GM level as a sign of respect and value, a source said. The NBA was composed of 74.4 percent black players in 2015, yet there are only three black general managers currently running the 30 NBA teams. Does the NBA need a Rooney Rule like the NFL for head coaching and senior operation jobs? Thunder general manager Sam Presti said he would “go on the phone” on Weaver’s behalf if he is interested in any GM opening. “I’ve been really fortunate to work with and partner with Troy over the years,” Presti told The Undefeated. “He’s been critical to our success and his commitment to the Thunder is unique in this day and age. We really value it. He has qualities that are hard to measure and impossible to learn. He has great feel and great intuition. A sense of things to really trust in. Perry has eight years of assistant general manager experience with the Seattle SuperSonics, Pistons and the Magic. His father, Lowell, was the first black assistant coach in the NFL when he was hired by the Pittsburgh Steelers in 1957. Yet, despite Perry’s front-office experience, championship pedigree and vast respect, he has never had one NBA GM interview. Another puzzling statistic is that Rivers and Demps are the only former black NBA players with president or GM roles in the league. The Knicks’ Hughes is, perhaps, the most experienced in an executive role. Others former NBA players in executive roles include Miami Heat director of scouting Keith Askins, Bulls assistant GM Randy Brown, D-League Westchester GM Allan Houston, Nets assistant general manager Trajan Langdon, Clippers assistant general manager Gerald Madkins, Hawks manager of basketball operations Malik Rose and Philadelphia 76ers chief of staff director Brandon Williams. Parker, Billups, Clippers forward Paul Pierce and former NBA guard Mike Wilks loom as future possible front-office candidates, as well. The NBA is also creating a Basketball Operations Associates Program for ex-players who have front-office aspirations (although it is not exclusive to ex-athletes). Billups loves his current job an ESPN NBA analyst, but the thought of working in an NBA front office remains intriguing to the ex-Pistons star. NBA agent B.J. Armstrong, formerly the Chicago Bulls’ special assistant to vice president of basketball operations Jerry Krause, actually has bigger ambitions for black former NBA players aspiring to be GMs. Michael Jordan’s former backcourt running mate believes they should think ownership “Like Mike,” instead. Jordan is the only majority African-American owner in the NBA. Former NBA player Grant Hill is part of the Atlanta Hawks’ new ownership group. Hall of Famer Shaquille O’Neal is a minority owner of the Sacramento Kings. Minnesota Timberwolves forward Kevin Garnett aspires to join the team’s ownership group when he retires. 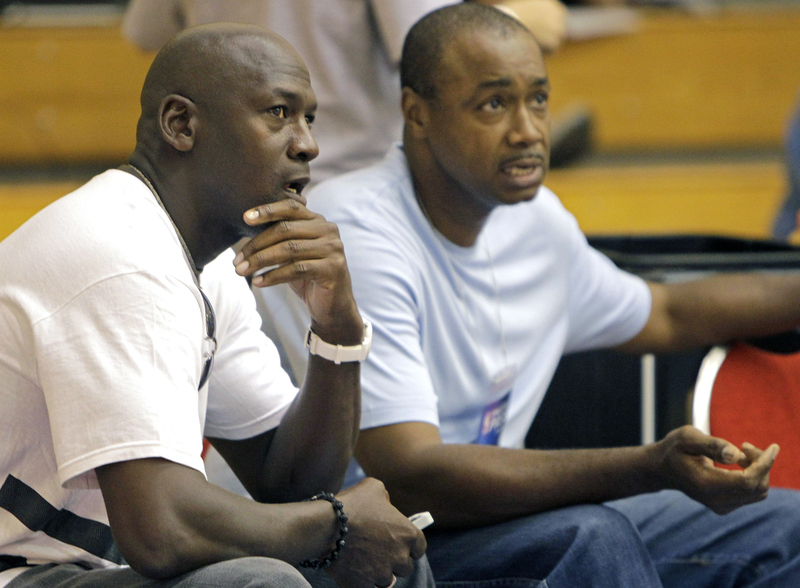 Michael Jordan, left, majority owner of the Charlotte Bobcats and general manager Rod Higgins watch an NBA summer league basketball game between the Bobcats and the Orlando Magic in Orlando, Fla., Friday, July 9, 2010. “All this talk about statistics, no,” Armstrong told The Undefeated. “We should be encouraging and empowering our youth on how to own it. No, don’t give me nothing. Let’s figure out how to encourage our youth how to earn it. Let’s encourage our youth to figure out and understand this business of sports in America and in the world. We are amid a generation of NBA players where more than a few handfuls will retire having earned between $250 million to $350 million in salary alone. Cleveland Cavaliers star LeBron James’ endorsement deal with Nike is said to approach $1 billion. Roberts agrees with Armstrong and wouldn’t be surprised to see players such as retired Los Angeles Laker Kobe Bryant and James as future NBA owners. While time will tell what the NBA front-office landscape will look like when Parker retires, his longtime Spurs connection could be helpful. The Spurs are arguably the top franchise in all of American sports, having won five NBA championships since 1999. Spurs coach and president Gregg Popovich and GM R.C. Buford are highly respected with an impressive GM tree across the league. Marks, Demps, Rivers, Presti, Utah Jazz GM Dennis Lindsey, Atlanta Hawks president and coach Mike Budenholzer all have Spurs ties. The Spurs have supported Parker’s GM dream by giving him advice with his French club and allowing him to sit in the Spurs’ war room in the past two NBA drafts. “R.C.’s door is always open,” Parker said. “He knows that being a GM is what I want to do. The Spurs have always been very helpful. They help me with any questions that I have.